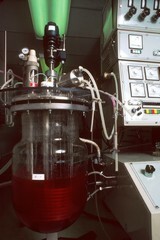 A laboratory setting and a piece of equipment that allows scientists to obtain interferon by conventional means. Presently this means growing human cells. Only the piece of equipment is visible.